New Jersey Democratic Sen. Cory Booker greeted guests at a campaign stop at the African American Museum of Iowa on Friday in Cedar Rapids. CEDAR RAPIDS, Iowa—Cory Booker is betting the path to the 2020 Democratic presidential nomination runs through young people and African-Americans—the same groups that propelled Barack Obama’s campaign. Mr. Booker’s stump speech recalls “the greatest infrastructure program this country has ever seen, the Underground Railroad” and his family’s history of integrating a New Jersey suburb. Meanwhile, the New Jersey senator embraces social media more than any other 2020 candidate. Alaeldin Dafalla, a 19-year-old political science major at University of Northern Iowa, said at Mr. Booker’s Waterloo event that his social media presence makes him more relatable than other politicians. “I keep up with all his vegan meals,” Mr. Dafalla said. It’s part of Mr. Booker’s effort to place himself as the inheritor of Mr. Obama’s sunny political coalition, which could appeal to moderate suburban Republicans who abandoned their party in last year’s midterm elections that saw the Democrats retake control of the House. While Democrats debate over health-care, tax and environmental policy, they are broadly united around the idea that defeating President Trump is paramount. A Monmouth University poll released Monday found 56% of Democrats would prefer a candidate who would be “a stronger candidate against Donald Trump” while 33% said they’d back someone they “agree with on most issues but would have a hard time” defeating Mr. Trump. JoAnn Hardy, the Democratic chairwoman in Iowa’s Cerro Gordo County, compared the electability question to choosing an imperfect spouse. “You marry them even if they’re not quite perfect and then you work on the details later,” she said. Mr. Booker’s first Iowa trek illustrated how he has identified his path to the nomination in a growing field of competitors. He was the first major candidate to visit the state’s biggest college town, Iowa City, and he held events in three major urban areas, including Waterloo, which has a black population of about 15%. Sen. Elizabeth Warren of Massachusetts is running as the party’s economic populist. Sens. Kirsten Gillibrand of New York and Amy Klobuchar of Minnesota, who is expected to launch her candidacy Sunday, say their large home-state margins of victory are evidence of their broad appeal across party lines. Kamala Harris of California and former Texas Rep. Beto O’Rourke, who has yet to enter the race, are both buzzy politicians who have drawn enormous crowds and the largest online fundraising networks. All the while, former Vice President Joe Biden is doing the best in early polling and Vermont Sen. Bernie Sanders, who is expected to announce his candidacy this month, nearly won the nomination in 2016. Ms. Warren’s events conclude with an orderly photo line and her staff taking photos; Mr. Booker’s finish with a scrum of supporters surrounding him while he records video selfies. 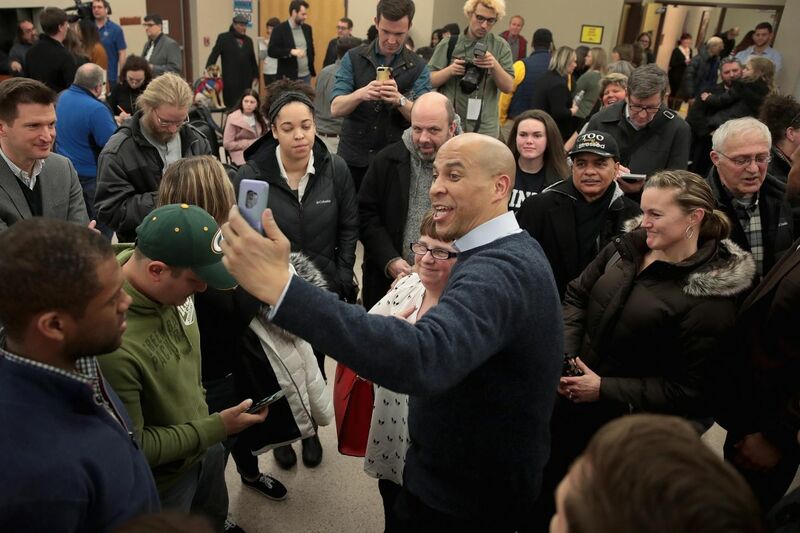 “This man is the champion of selfies,” Mark Smith, the Democratic leader in the Iowa House, said while introducing Mr. Booker Saturday in Marshalltown. Mr. Booker interrupted a question about farm policy from Chris Petersen during his Mason City town hall to record a greeting for Mr. Petersen’s wife. “Everybody say hello to Kristi,” Mr. Booker asked the crowd. “All I said is, ‘My wife says hi,’ and he comes over and grabs my phone,” Mr. Petersen, a farmer, said afterward. Mr. Booker’s focus on black voters is liable to bear more political fruit after Iowa’s first-in-the-nation caucuses. African-Americans make up 3.8% of Iowa’s population and were 3% of Democratic caucus goers in 2016, but they are a sizable force in Democratic politics elsewhere. Black voters dominate primaries in South Carolina and other Southern states that follow Iowa and New Hampshire on the presidential nominating calendar. In Waterloo Friday, Mr. Booker presided over a discussion in which six of nine panelists were African-American. In Cedar Rapids, he sat with a group of young local elected officials that included Mazahir Salih, an Iowa City council member who in 2017 became the nation’s likely first Sudanese-American elected official. “What are you planning on doing for black people?” Yolanda Spears, a clinical assistant professor of social work at the University of Iowa, asked Mr. Booker during a house party in Iowa City. Mr. Booker responded with a recitation of his work to add more people of color to Senate staffs and to change federal sentencing guidelines for prisoners convicted of nonviolent crimes, and of his “baby bond” proposal, which would allot $2,000 at birth and up to $1,000 annually after that to every child in the U.S., which they could access on their 18th birthday. Mr. Booker said he would fund the proposal by raising the corporate tax rate from 21% to 25% and by repealing the estate tax cut enacted in 2017.